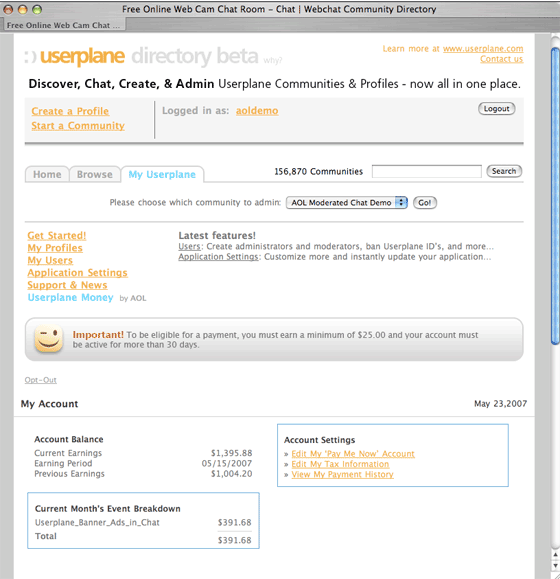 Userplane Money serves ads in instant messaging, web chat and other widgets. The new program is said to be the first of its kind amongst community platforms. Userplane CEO Mike Jones sees what he calls the “Platform Web” as the next area of online monetization. ” Userplane Money offers rich application experiences that increase user engagement on our clients’ websites, and provide them with a new revenue channel and increased site usage”. Userplane was acquired by AOL in August 2006 and the new program is linked into AOL’s larger advertising strategy. “AOL has a rich offering of ad solutions for advertisers, including internal advertising within the AOL network, 3rd party publisher relationships through advertising.com, and a longtail ad offering through the Userplane network” said Jones.”Userplane Money grows the Userplane longtail ad network and gives advertisers access to users and inventory they had not had access to previously on smaller, targeted niche web communities”. Jones sees Userplane Money as a way to reward users and position the service as a key revenue driver for smaller up and coming web communities. The combination of Userplane’s technology with a revenue-sharing program is sure to drive future growth to what is already a very smart offering. Previous TechCrunch coverage of Userplane here.